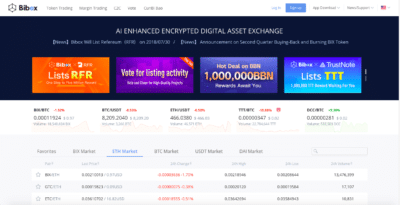 Gemini Exchange Full Review - Is it Safe in 2019? In this Gemini exchange review we’ll take a look at the funding options, coin support, fees, and features the platform offers, as well as proving a simple step-by-step guide on getting started with Gemini and how to perform basic trading on the Gemini exchange. 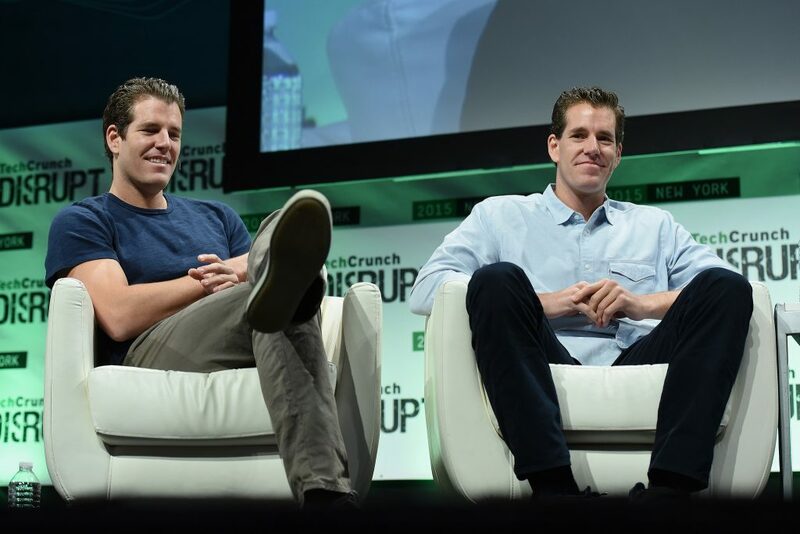 Based in New York, Gemini was launched by the Winklevoss twins in 2015. Best known for suing Mark Zuckerberg over Facebook, the twins were awarded more than $65 million in an out-of-court settlement and subsequently invested more than $11 million into Bitcoin in 2013. This buy made the Winklevoss twins the holders of the largest portfolios of BTC— equivalent to over 1% of the total dollar value of Bitcoin— at the time. The launch of Gemini was handled in a very different manner to most exchange platforms. Gemini was the world’s first fully-regulated cryptocurrency exchange, and was designed with full U.S. regulatory compliance in mind. As a result, the AML and KYC requirements of Gemini are somewhat more strict than other platforms, but this is balanced by low fees and other competitive features. Gemini benefits from a secure banking relationship with a New York State-chartered bank, which means all US dollars held by the platform are FDIC insured. This has drawn a large number of institutional investors to the exchange. In December 2017, Chicago-based derivatives market Cboe Global Markets launched futures contracts for BTC, with prices calculated solely based on Gemini’s auction price for Bitcoin. This caused a massive volume surge on Gemini, catapulting the exchange into the top ten exchanges by volume. Gemini offers a limited range of trading pairs, and doesn’t list any altcoins, supporting only USD as a fiat currency. One of the biggest draws of the Gemini cryptocurrency exchange is the option to trade real dollars— many exchanges don’t offer direct crypto to USD trading, forcing traders to use the highly controversial cryptocurrency Tether as a workaround. 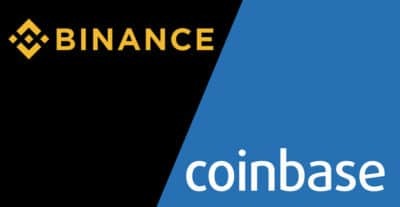 As an exchange, Gemini is responsive, intuitive, and streamlined, although it does lack some of the more complex trading and analysis features offered by platforms such as Binance or Bitstamp. 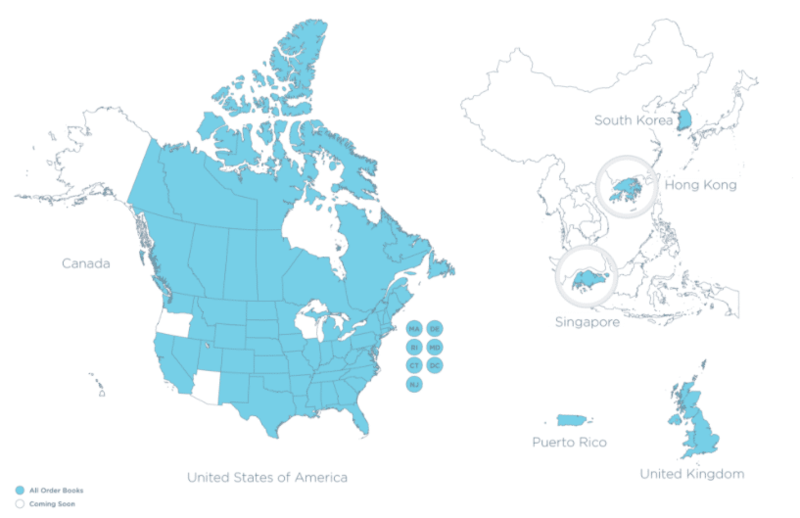 Gemini is also rather limited in terms of availability outside of the US— the platform only services international users in Singapore, Hong Kong, South Korea, Canada, the UK, and Puerto Rico. The high level of regulatory commitment maintained by Gemini makes it one of the safest exchanges for US-based customers, with all digital assets are custodied in trust behalf of users. Gemini’s customer support also makes it stand out from other exchanges, with response times far swifter than any other exchange. Like most exchanges that boast strong regulatory compliance, Gemini has a strict verification process. Gemini is operated by a Trust Company, and as a such must comply with a range of different requirements set by the New York State Department of Financial Services. This means Gemini not only adheres to KYC and AML requirements, but also capitalization, compliance, consumer protection, and cybersecurity requirements. This makes Gemini highly secure and stable but does make the verification process more complex. Gemini verification and signup is relatively straightforward, however, and begins with simple email and phone number verification process. 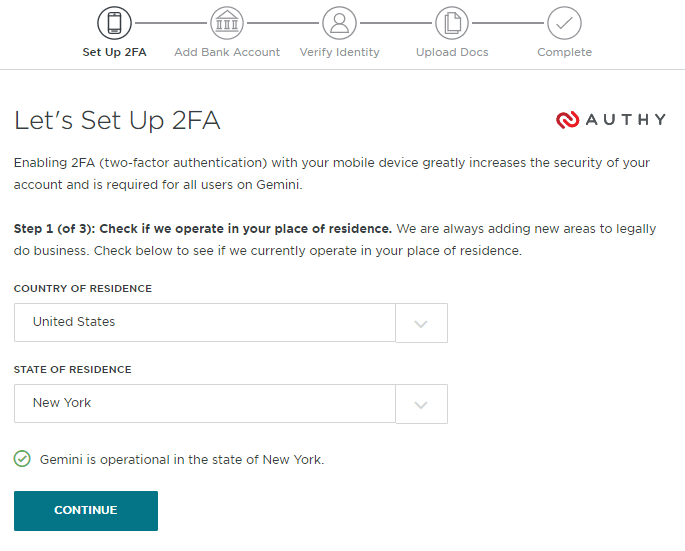 Users are guided through a two-factor authentication setup process, which adds another layer of security, then are required to add the bank account they’d like to use with Gemini. 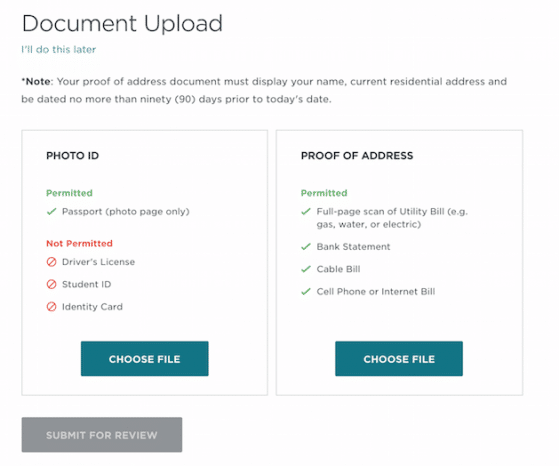 Gemini then performs an ID verification step that requires both government-issued photo ID as well as supporting documents that provide proof of address. Note that driver’s licenses are not supported by Gemini as photo ID— passports are the only form of photo ID supported by Gemini. Proof of address can be provided by utility bill scans, bank statements, and a few other options. While these requirements may be stringent compared to other exchanges, Gemini is known to have an extremely fast verification process. Gemini currently only offer ACH bank transfers and wires as fiat funding methods and does not accept credit card funding. Withdrawals can be made via the same methods. Deposits and withdrawals can be made strictly in USD only. Gemini limits deposits made by individuals and institutions on different scales. Individuals are able to deposit a maximum of $500 USD daily, while institutions are able to deposit up to $10,000 daily. Deposits are also capped at $15,000 USD monthly for individuals and $300,000 monthly for institutions. Gemini withdrawal limits are set at $10,000 both daily and monthly for individuals, and $100,000 both daily and monthly for institutions. It’s also possible to fund Gemini wallets via either Bitcoin or Ether. Gemini fees are relatively straightforward when it comes to funding or withdrawal, but become more complex when trading is involved. Transferring either Bitcoin or Ether into a Gemini account is free. Surprisingly, via ACH or wire transfer is also free, which is a feature not found on many trading platforms. Gemini exchange fees are somewhat more complex. The Gemini exchange uses a real time “dynamic maker-taker fee schedule”. This dynamic fee scale is what makes Gemini so attractive to individuals trading large amounts of BTC or ETH, as users with high volume benefit from fee-free liquidity-making trades and fees as low as 0.10% for liquidity-making trades. Fees are determined by a user’s Gemini exchange trading volume over a 30-day period for each individual trading pair. Fees on Gemini are calculated as a fraction of notional value and presented as basis points, or BPS, which represent 1% of this value. 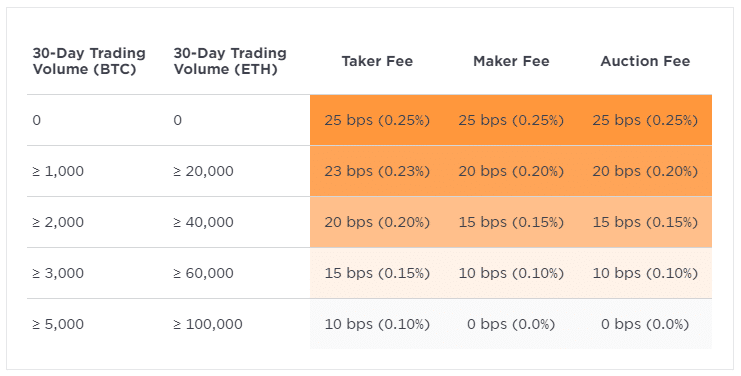 It’s important to understand the difference between “maker” and “taker” orders when assessing the Gemini trading fee structure. Orders that fill immediately by matching with trades from an order book immediately remove liquidity from the book, and are thus referred to as “taker” orders. Orders that are posted to an order book and don’t fill immediately bear a greater market risk and add liquidity to the order book, thus they are labelled as “maker” orders. Is Gemini safe? As the exchange is highly focused on regulatory compliance and handles a significant amount of institutional investor capital, Gemini has a strong reputation for rock-solid security and reliability. Gemini is governed by the BSA, or Bank Secrecy Act, and conforms to strict anti-money laundering regulations. In order to meet the stringent regulatory requirements enforced upon New York-based exchanges, Gemini boasts some of the strongest exchange security online. All funds held by Gemini are stored in secure offline multi-signature cold wallets. The Gemini website lists some interesting methods the platform uses to minimize security risks, such as sourcing hardware from multiple suppliers and co-ordinated employee actions at all facilities. All hot wallets are hosted on Amazon Web Services architecture, and have been evaluated to Federal standards. All fiat currency funds held by Gemini for users are covered by FDIC insurance, which is a major advantage to US-based traders. User actions such as transfers, logins, and withdrawals are subject to mandatory two-factor authentication. While users are required to completely de-anonymize themselves in order to use Gemini, the benefits are clear for individuals seeking a highly secure, insured, and completely regulatory compliant exchange. For individual investors, Gemini offers only a relatively basic feature set. The upside to Gemini’s simplicity is that the platform is relatively forgiving to newer cryptocurrency investors and traders, and doesn’t harass users with overly complex features or options. Institutional investors benefit from the option to open depository or segregated custody accounts in order to adhere to legal requirements. Developers and advanced traders are able to access the Gemini API, which can be used to access public market data or conduct private trading sessions. The Gemini auction works by determining the aggregate price at which buy demands and sell demands can be filled. Interestingly, Gemini auction trades benefit from the Gemini maker fee discounts. While Gemini crypto trading is simple and the website is tablet and smartphone friendly, there is currently no Gemini Bitcoin app or any Gemini app announced. Gemini currently only supports the trade of Ether and Bitcoin, offering only BTC/USD and ETH/USD trading pairs. No other fiat currencies are supported. Gemini offers above industry standard support to users, typically responding to either email requests within a few hours. Gemini is also one of the only exchanges to offer a dedicated customer support line. Overall, Gemini’s customer support is extremely efficient when compared to other exchanges. The platform also publishes a blog that delivers key information, as well as a comprehensive FAQ. Gemini offers a fluid trading experience that demonstrates the significant amount of capital supporting the exchange. Order book controls are orderly and clearly defined, although there is a lack of more complex technical analysis tools that some advanced traders will definitely miss. As the Gemini platform is focused solely on the trading of Bitcoin or Ethereum, the user interface is stripped-back, lightweight, and intuitive. Buying and selling either Ethereum or Bitcoin is performed via an easy-to-use order system complete with tools. 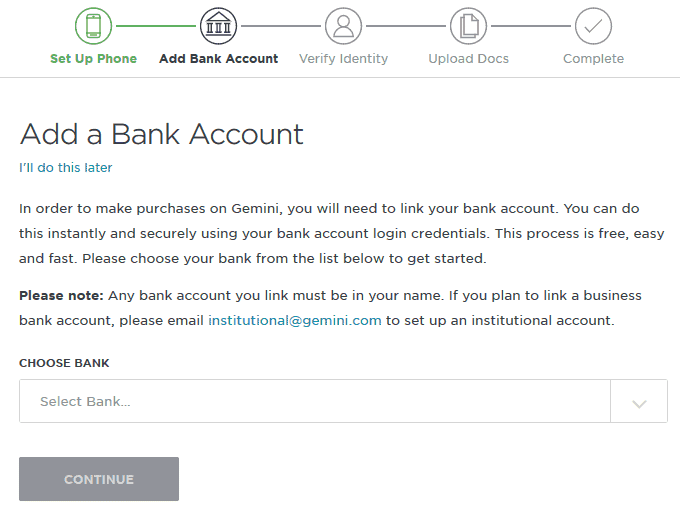 Opening an account and getting started with Gemini is relatively straightforward. To get started, navigate to the Gemini website, but before getting started ensure that the Gemini URL in the address bar of your browser is secure— your browser should display this with green text and a padlock icon before the address. 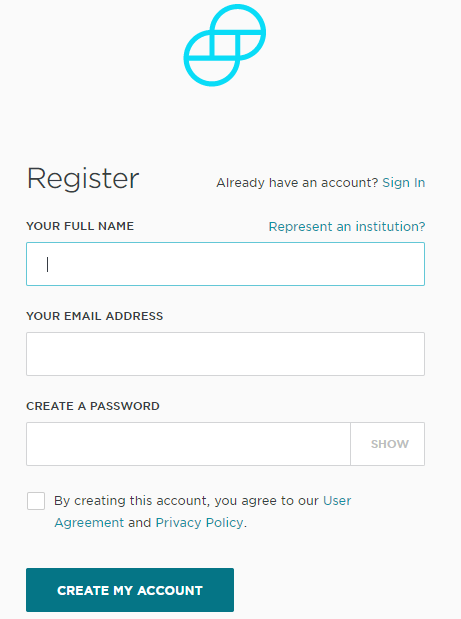 As you’re likely to be setting up a personal account, you’ll need to click “Register” at the top right of the Gemini landing page. You’ll be presented with a simple form that requests your full name, an active email address, and a strong password. When creating passwords for cryptocurrency-related purposes, it’s best to create extremely difficult passwords in order to eliminate potential hacking attempts. Secure Password Generator is a highly useful site that instantly generates complex passwords that can be used for this purpose. After completing this form, you will receive a confirmation email from Gemini that will contain a verification code. Provide this verification code when prompted in order to move on to the next step of the verification process. The Gemini verification process consists of four elements— two-factor authentication setup, bank account linking, identity verification, and document upload. Two-factor authentication helps to prevent hacking attempts on your account and ensures that even if your account becomes compromised there is no way a malicious party would be able to access your capital without access to your phone as well. To set up two-factor authentication with Gemini, provide your mobile phone number when prompted during the registration process and submit the authentication code. Whenever you log in or perform important account actions such as trades or withdrawals the two-factor authentication process will require you to submit a code sent to your mobile phone. In the next step, you’ll need to link your bank account to Gemini. If you’re based internationally it’s possible to verify your bank account via wire transfer instead, but this does take longer. Gemini takes KYC and AML requirements very seriously, and as such has extremely stringent document requirements for identity verification. In this step, you’ll need to upload identity documents as outlined below. Verification on Gemini is extremely fast, typically only taking a few hours to a day to complete. Now that your identity is verified and your bank account is linked, you’re ready to start trading on Gemini. Before you can trade, however, you’ll need to fund your account. 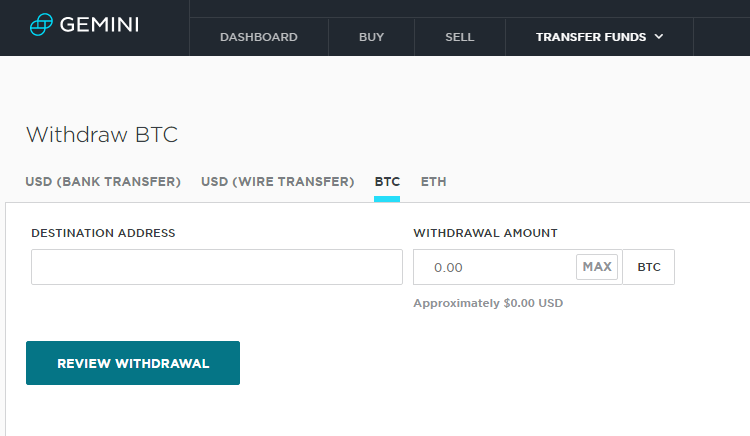 If you’ve connected a US-based bank account, you’ll be able to fund your account directly via bank transfer under the “Transfer Funds” button at the top right of the Gemini menu once logged in. If you want to begin trading immediately and already own some Bitcoin or Ethereum, it’s possible to fund your Gemini wallet directly. 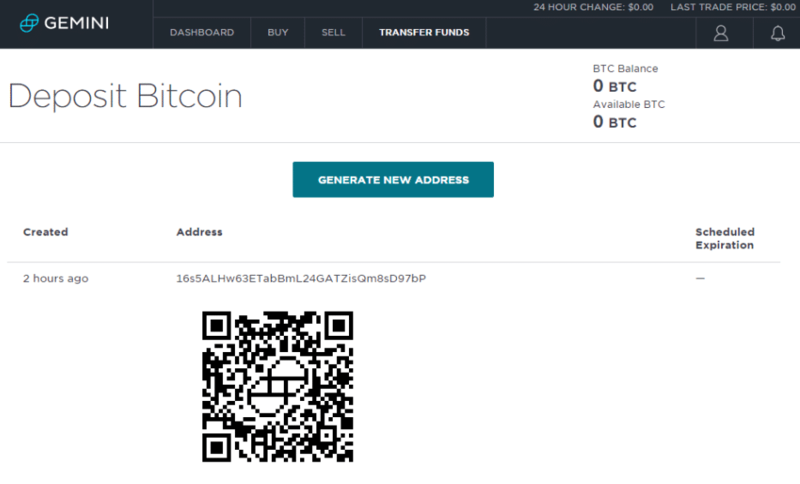 To fund your Gemini account with Bitcoin, navigate to “BTC” in fund your transfer options. You’ll be provided with a simple QR code that can be used to transfer funds if you use a smartphone wallet, or a text wallet address. Depending on the state of the Bitcoin blockchain, your Bitcoin should be available in your Gemini account within the hour. Buying or selling cryptocurrency on Gemini is extremely easy. To purchase Bitcoin on Gemini, simply press the “Buy” button on the top menu. 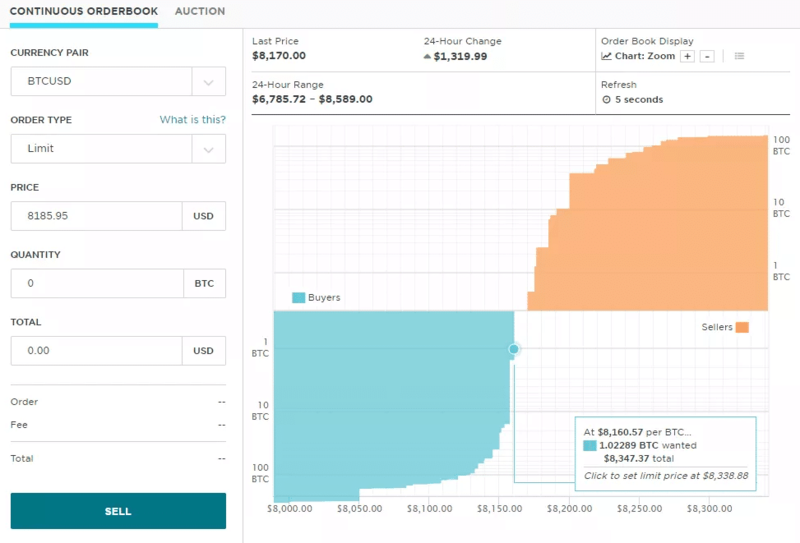 You’ll be provided with a simple order interface and a slick order book display chart. 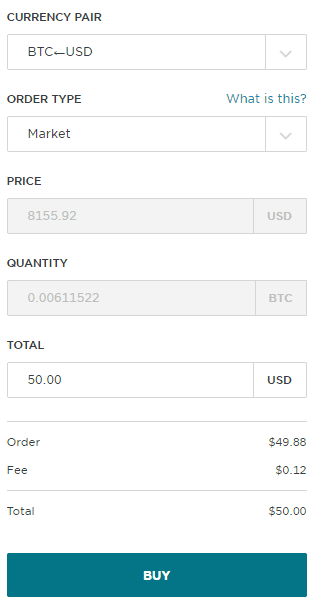 Once you’re ready to buy some Bitcoin, you’ll need to fill out the order panel. Select the currency pair you want to trade— in this example we’ll buy some Bitcoin. Select your order type at this point— market orders will be filled the fastest and are the simplest for new traders. When you’re ready to buy, hit the blue “Buy” button. Depending on the type of order you’ve created, your Bitcoin will be available in your Gemini BTC wallet as soon as the order is filled. Depending on the amount of cryptocurrency you’re holding, you may want to store it in a secure location. Although Gemini is an extremely secure exchange, it still hosts your cryptocurrency in a “hot” wallet when in use, and doesn’t provide you with access to your private keys. To withdraw Bitcoin from Gemini, you’ll need to locate “Withdraw from Exchange” under “Transfer Funds” in the top menu. You’ll be presented with a simple form that allows you to transfer your Bitcoin to another Bitcoin address. Paste the correct Bitcoin address in the “Destination Address” field, confirm the withdrawal amount, then click the “Review Withdrawal” button. When you’re happy with the withdrawal order, transfer your Bitcoin. Hardware wallets such as the Trezor or the Ledger Nano S are the best option when storing large amounts of cryptocurrency. As these devices are not connected to the internet and are designed from the ground up with security in mind, they’re the safest way to store your cryptocurrency. Gemini is a strong exchange that has dramatically improved in popularity over the recent years. While the platform may not offer a diverse range of altcoins or support complex trading features, it’s one of the safest and simplest ways to buy Bitcoin and Ethereum. Anonymity-minded individuals may not like Gemini as it requires a significant amount of personal information, but the stringent regulatory compliance of the exchange allows it to offer fast bank transfer for US-based traders and delivers FDIC insurance. If you’re a beginner crypto investor based in the United States, Gemini is a great place to get started. Gemini is one of the best exchanges to buy Bitcoin or Ether safely and securely, as long as you live in one of the few supported countries. 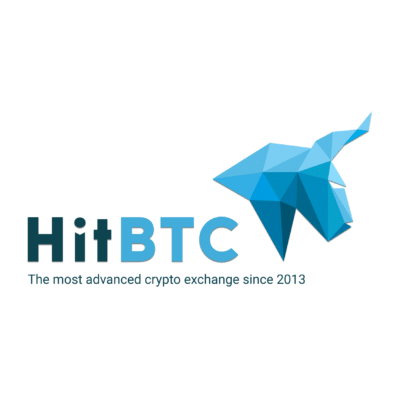 Their interface is simple to use and perfect for people looking to get started in crypto. Previous article MyEtherWallet vs MyCrypto Wallet – Which one should you use? Next article Kraken Review and Full Guide – Is it Safe in 2019?